Brighten your attitude and boost your business communication skills! Ideal for speakers, trainers, authors, coaches, consultants, managers, leaders. Based on the 7 Multiple Intelligences research by Howard Gardner, Ph.D., and Thomas Armstrong, Ph.D.
REQUEST the handouts to be emailed! 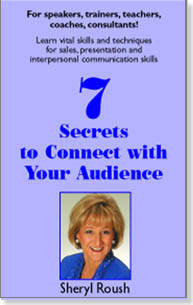 Live presentation Sept. 2002 for the National Speakers Association.